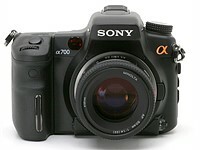 On paper the A700 offers a similar level of features as the other cameras but the lower end of the price scale. It does include sensor-shift image stabilization, that gorgeous high resolution LCD monitor and a range of usability features (eye-start auto-focus, automatic mirror lock-up) which are a part of its Minolta heritage. On the negative side the lack of a top panel status LCD means you have to use the power hungry rear LCD for status, the plastic body could be seen by some as a negative (although personally it didn't bother me) and of course it's the only one of the four here not to offer Live View. Loved the camera. Still have it and use it as a backup with my telephoto for the crop factor even after moving to Sony A7ii. I still prefer it's nice pentaprism, Optical Viewfinder and ergonomics compared to the A7ii but it's focusing system, metering, and dynamic range have definitely been left far behind by the newer cameras. Turning ten years old this week is the A700, Sony's first high-end DSLR after fully taking over Konica Minolta's camera business. With plenty of Minolta DNA, it debuted in September 2007 to take on the likes of Canon's 40D and Nikon's D300. Nearly two years after Konica Minolta transferred its camera division over to Sony, and over a year after Sony's first DSLR (the A100), today is the day that the curtain is finally lifted on the long-awaited 'high end' Alpha digital SLR (in principle the replacement for the Konica Minolta 7D). The new model sports an impressive specification including magnesium alloy construction, 12MP CMOS sensor (with on-chip A/D conversion), 5fps shooting and a wealth of features and customization options, though interestingly (given the recent spate of announcements) no live view option. There's also a couple of new lenses and a new vertical shooting grip. We've had a pre-production A700 for a couple of weeks in order to produce a detailed hands-on preview, available now.